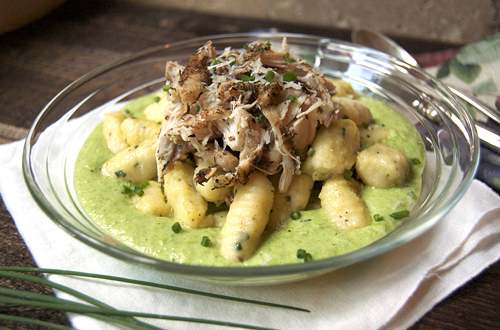 Potato Gnocchi w/ Jerk Chicken on Sweet Pea Puree–My Chef Dennis Guest Post! I am so excited to tell you that I am a part of Chef Dennis’ “guest post Fridays” for September 2nd! Dennis is a great guy in the food world and I am so excited to be guest posting for him! I have had about a month to decide what recipe I would use for my guest post, which might have made it even more difficult, but I finally decided I would share this recipe that was passed onto me by a good friend. She told me that she suffered sweating in the non-air-conditioned lobby of a hotel in South America in order to e-mail me this delicious recipe. I am glad she did because it is delicious! Please head over to A Culinary Journey With Chef Dennis for the full post and say hi! Congrats!! Looks like a wonderful dish, going to check it out! Congratulations on an AMAZING guest post! I LOVE gnocchi and your tips and hints for making it is spot-on! But when you added the chicken and pea puree on top? You really made this an over-the-top delight! It sounds so delicious. Your pictures are absolutely stunning…. I love the spice picture on Chef Dennis’ blog. I haven’t seen spices done that way yet….love a new angle. Congrats on being the guest poster for Chef Dennis! What an honor! thank you so much for such a wonderful guest post! 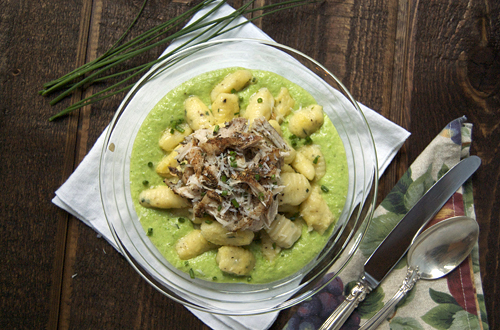 I absolutely love the gnocchi’s you made, and your images are gorgeous! thanks again for all your hard work, I hope you have some time to enjoy this labor day weekend! Saw you delicious post on Chef Dennis blog and came to check you out for ourselves. Delicious recipe love the pairing of the gnochhi with the jerk chicken! I saw this on Chef Dennis’ blog and just had to come by and say it looks delicious and I admire your photography.